"Devika Rani Roerich" (1946) by artist Svetoslav Roerich. Devika Rani was well established as an actress, producer and singer before she married Russian painter Svetoslav Roerich. The couple went on to enrich India’s art and cultural scene for almost five decades. An accidental actress, Devika Rani entered the world of Indian cinema after meeting film producer Himanshu Rai during her student days in London. She would go on to marry Rai and then rise to heights in Bollywood both as an actress, who was often paired with Ashok Kumar, and as the head of the Bombay Talkies studio that she co-founded with Rai. She continued to produce popular films after Rai’s death in 1940. Devika Rani was a path-breaker in many ways in Indian cinema, acting in ‘Karma,’ India’s first talkie film in 1933, where she also sang the first English song in an Indian film. ‘Hamari Baat,’ the last film she acted in (produced in 1943) had a then unknown actor called Raj Kapoor in a minor role. A year later, when she was working on the production of ‘Jwar Bhata’ (one of Dilip Kumar’s first films), Devika Rani met Svetoslav Roerich. The son of the mystic, artist, philosopher and writer Nicholas Roerich, Svetoslav was already a famous artist in his own right. 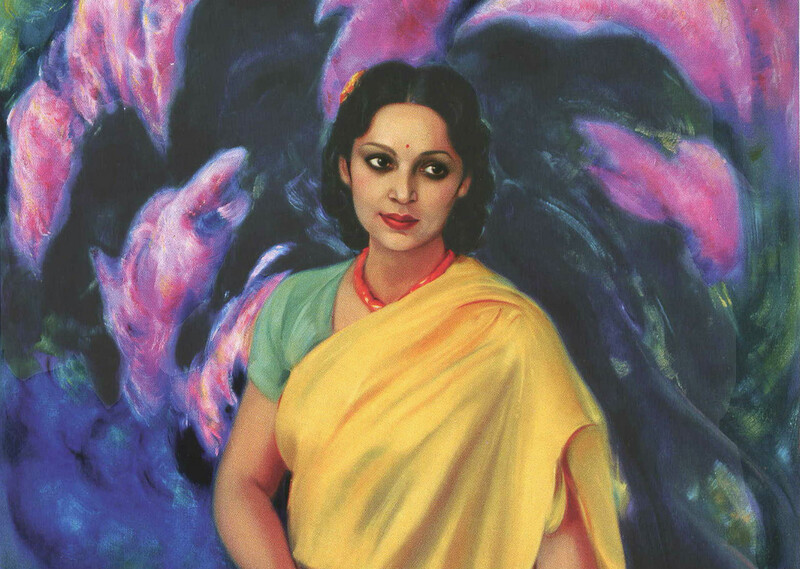 Devika Rani visited Svetoslav Roerich’s studio while looking for an artist to design the sets for her last film. “The meeting changed the course of her life,” the International Roerich Memorial Trust wrote in a tribute to Devika Rani. They established a strong rapport that would lead to their marriage in a year. Devika Rani then moved to Kulu completely abandoning her film career. Her stay in the valley would be relatively brief, as the couple would move to Bangalore four years later. However the people and landscapes of the Kulu Valley left an indelible mark on her life. The couple left Kulu in 1949 and settled in the sprawling Tataguni Estate in the outskirts of Bangalore. Svetoslav Roerich took Indian citizenship and lived in Bangalore for the rest of his life. Such was his popularity among the Indian elite that three of his paintings adorn the Central Hall of Indian Parliament. They are portraits of Jawaharlal Nehru, Indira Gandhi and Sarvepalli Radhakrishnan. Although the couple largely led a reclusive existence in Bangalore, they were a part of the cultural and artistic scene. The couple devoted a lot of time and energy in developing the Karnataka Chitrakala Parishath, one of the most prominent cultural institutions in the city. The couple suffered from ill health during the 1990s and there were widespread allegations of theft of their property and belongings. Svetoslav Roerich passed away in 1993 and Devika Rani died a year later. The childless couple’s estate was a subject of wide litigation. India’s Supreme Court finally ruled in favour of the Karnataka government, which claimed the 468-acre estate. The Karnataka government is converting the Tataguni Estate into a museum and cultural centre with a permanent gallery for Svetoslav Roerich’s paintings. One can only hope that the estate can be restored to what it was like in its heyday, and have the same serenity and spiritual vibrations as the Roerich family estate in the Kulu Valley. Ajay Kamalakaran is RBTH’s Consulting Editor for Asia. Read more of his articles here. Follow Ajay onTwitter and Quora.